Knowing how to wear cufflinks is important, because cufflinks are most certainly one of the finest and most dashing pieces to any man's wardrobe. So if you don't know how to wear cufflinks, you've come to the right place to learn! Links may be small, but they speak volumes about your sense of style and swagger. It’s the little details that count the most and few other items of clothing can add so much instant class and polish to your look. One advantage finely-dressed men in the U.S. have is the fact that cuff links are not yet the standard here like they are in Europe. This brings a sly smile to the face of many stylish men, because they can virtually "corner the market" in this aspect of high fashion. It is amazing how many times a man can be complimented on such a small but impressive item, women love accessories and the man who knows how to wear them. By accessorizing with cufflinks, you easily come across as a very suave dresser. The choice of stone, color, or style of the cufflink is purely personal, you can wear simple regal-looking links or really stand-out type unique cufflinks or something in between. It totally depends on you and your personality, as long as they compliment some part or the whole of your suit, shirt and tie ensemble of course. stones, locket cufflinks and much more. The choices are absolutely endless, the power is in your hands and on your wrists! Cufflinks cannot be worn with just any old style of button up. 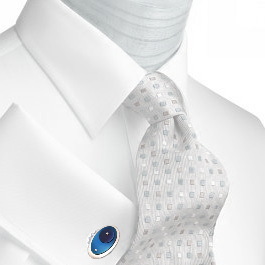 Specific shirts like french cuff dress shirts are manufactured especially for the usage of links. Be certain that you push the bar through each aligned sleeve hole, the shirt cuff-holes should all align naturally and straight. After you've done that, now open the swivel bar so that it forms a "T" to secure the cuff in it's place, as shown in the three bottom pictures on the right hand side. That's it, now you know how to wear cufflinks!